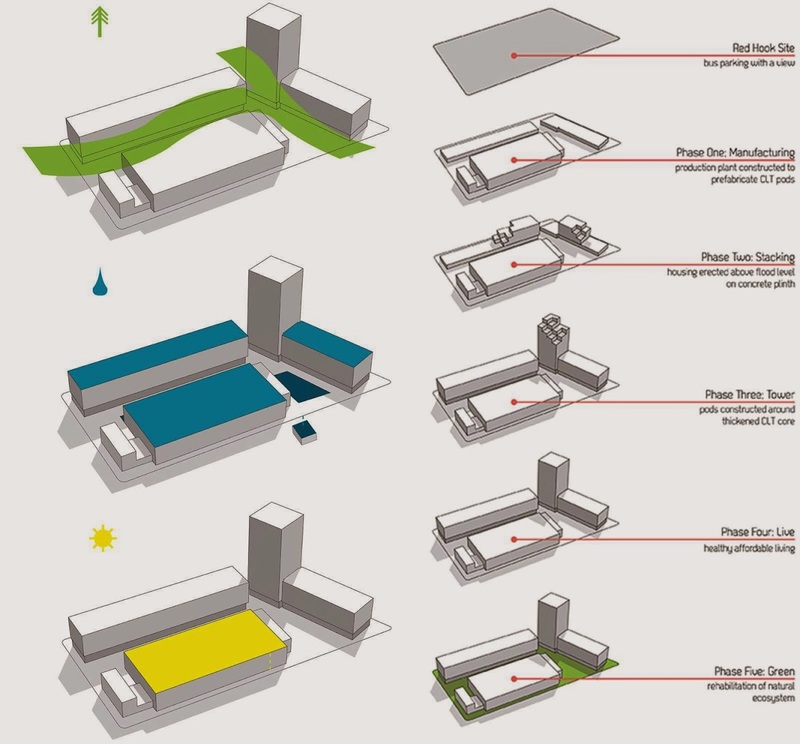 The Association of Collegiate Schools of Architecture (ACSA) awarded the project “Grow Your Own City”, designed by Benjamin Bye, Alex Kenton, and Jason Rood, the first prize at the Timber in the City Competition. “This winning design comprehensively solves the major elements of the competition program and gestures towards new thinking in relation to timber construction and wood technology. Each building describes a distinct form of construction, and the application of wood at all three scales is handled beautifully. There is a mature sensitivity to zoning, politics, and concerns of gentrification. 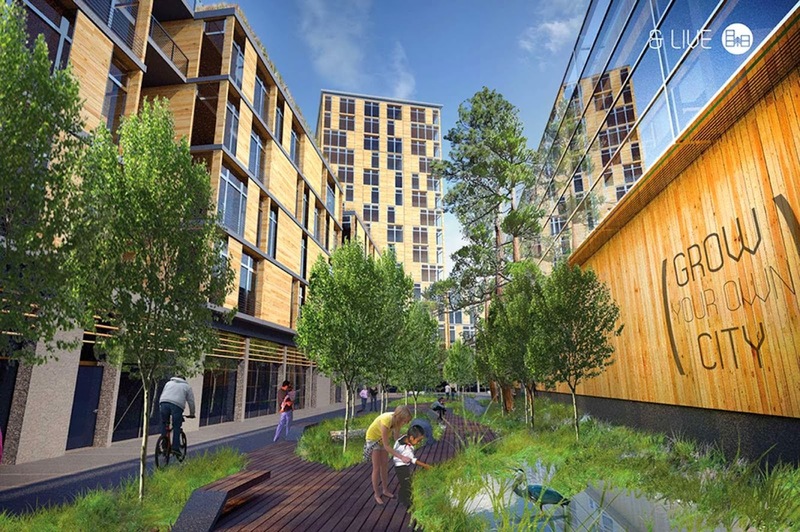 This design exemplifies smart urban planning by placing the warehouse on the industrial street and creating a new pedestrian street behind, which is an incredible relief for the neighborhood.” Juror comments. 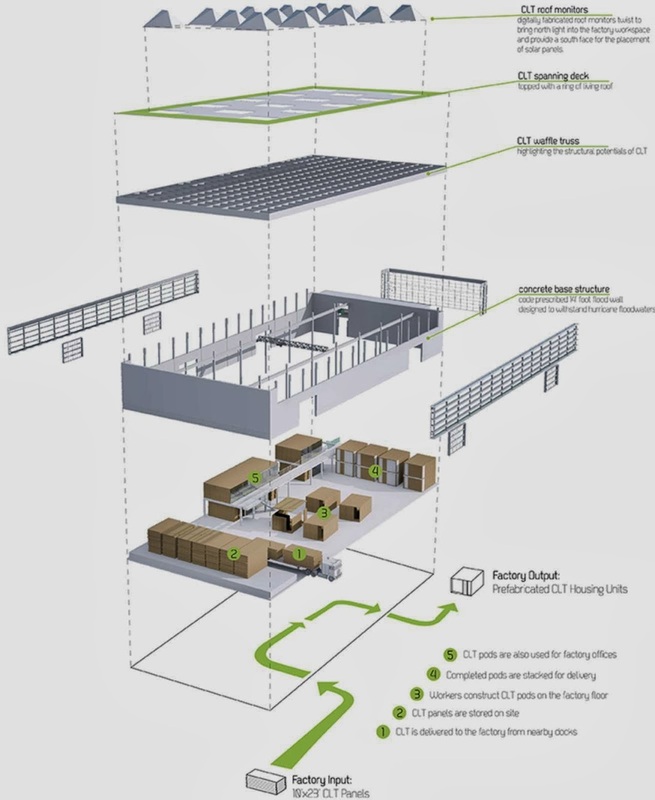 “Grow Your Own City is a modular based building concept that takes advantage of the material properties, strength and dimensions of Cross Laminated Timber. the design process is based on a prefabricated Clt pod that can be assembled, finished, and shipped from the factory. 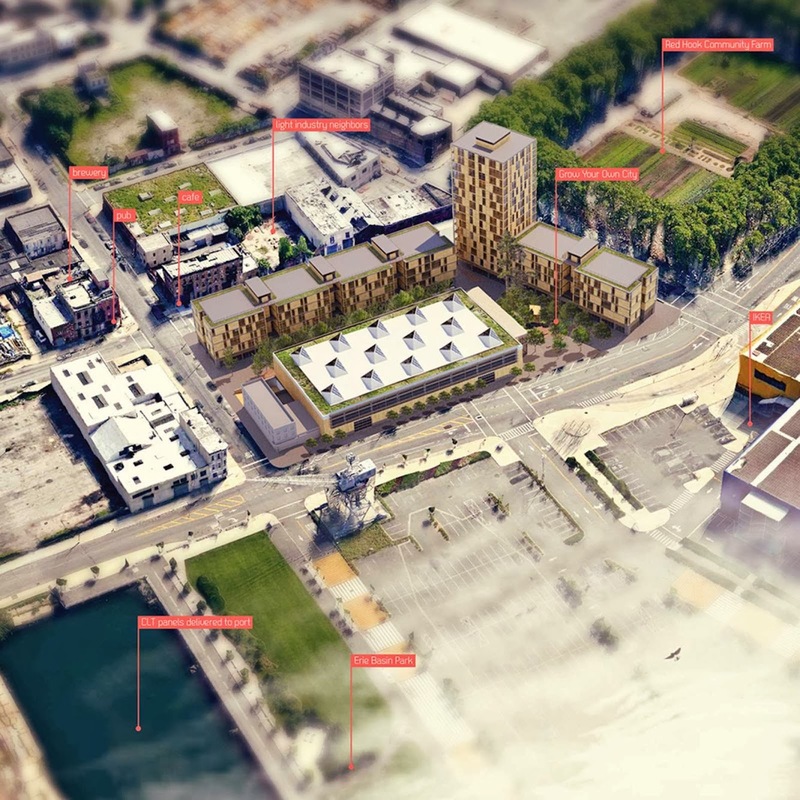 the pods are stacked on the Red Hook site to form low-rise housing and a tower, with the Clt panels acting as both load-bearing and shear walls. The Clt pod is designed and engineered according to the Cross Laminated Timbers material properties. the façade is panelized with both solid Clt and floor to ceiling windows. Each pod type, whether a studio, living space, or bedroom, is assigned a quantity of shear panel and glazing that forms a pattern on the façade, giving it both regularity and variety. Based on the competition requirements of a 325 square foot studio unit, one pod with interior dimensions 15 ft by 22 ft. comprises a studio. the one-bedroom unit is two pods (660 sf), the two-bedroom unit is two and a half pods (825 sf) and the three-bedroom unit is three pods (990 sf). 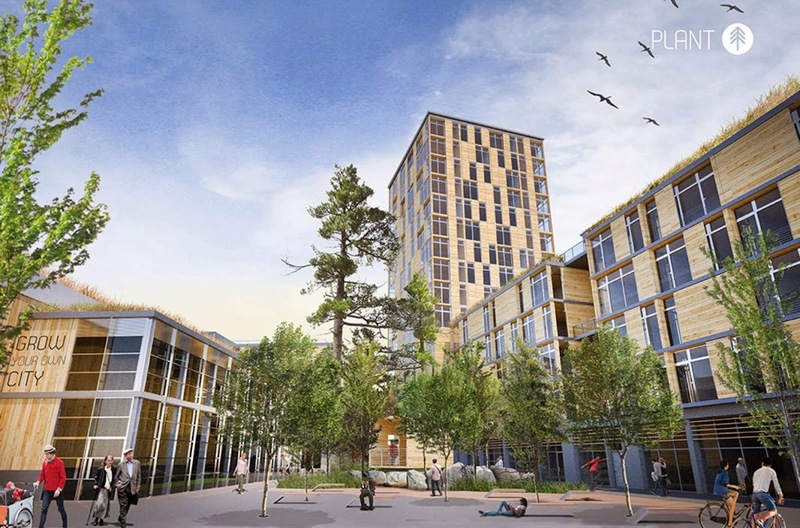 in both the standardization of pod type and placement, and the low embodied cost of Clt, Grow Your Own City stays true to the project brief and is very affordable and environmentally friendly.” Description from the architects.